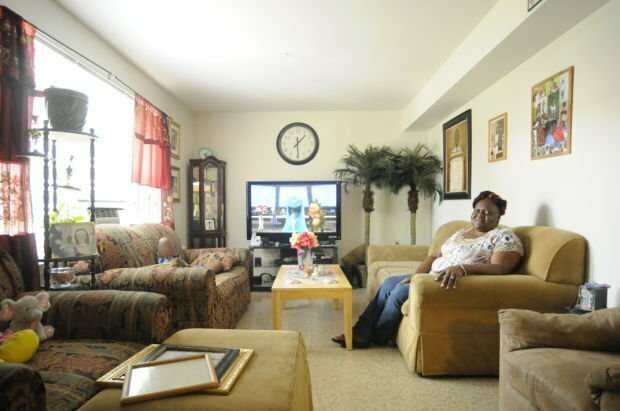 Norvelle Bowman, a Brogan Manor tenant, resides in one of the affordable housing complex's newly renovated units. Twenty-four of Brogan Manor's 88 housing units have been remodeled as part of a redevelopment project. Renovations have also been made to the exteriors of the apartments, sidewalks and mailboxes. A before, left, and after comparison of a kitchen inside a Brogan Manor housing unit following the initial phase of a complex-wide redevelopment project. A before, left, and after comparison of a bathroom inside a Brogan Manor housing unit following the initial phase of a complex-wide redevelopment project. AUBURN | For around 40 years since their construction, affordable housing units at Brogan Manor in Auburn have not been handicapped accessible — quite the problem for tenant Norvelle Bowman. She moved into her apartment unit at Brogan Manor about four years ago with her grandson. While living there, Bowman had difficulty with tasks that some take for granted due to a history of health issues, including arthritis in both knees and diabetes. Stairs, for example, became mountains for her during the bad days. "When I had to come from the basement, upstairs, up the next stairs and tried to come back down, I used to crawl some days," she described. 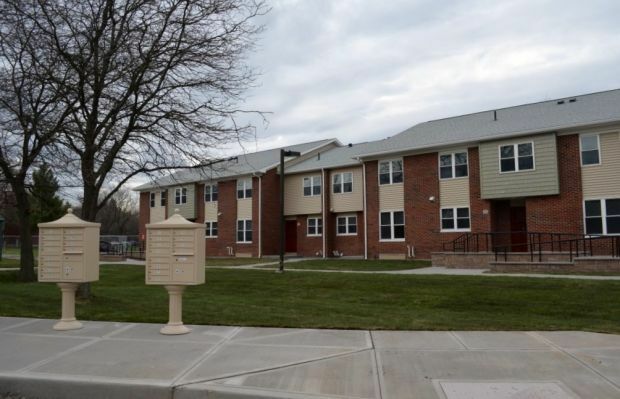 Since May, however, four years of struggle finally gave way to convenience after developers completed the first phase of a complete overhaul of all affordable housing units at Brogan Manor. The $12 million redevelopment project, which has been in the works since 2011, incorporates a total remodel of each housing unit and calls for the installation of new residential amenities as well. The Auburn Housing Authority and its nonprofit affiliate, AHA Development Corporation, announced that renovations in 24 of Brogan Manor's 88 units are complete to wrap up the project's first phase. Phase two, a remodel of 20 units, is scheduled to finish in October. Bowman is among the tenants living in one of the completed spaces — hers is also one of five planned handicapped-accessible units. Five other units will be redone to cater to the sight and/or hearing impaired. All of Bowman's needs are now on one floor surrounded by new walls, appliances and flooring. Gone are the stairs that she dreaded at times. With the interior remodel also came exterior improvements to several outside features of the apartment units, such as the roofing and siding. Apartments are connected by a series of fresh sidewalks that are kept illuminated at night by newly installed lampposts. Outside lighting was practically nonexistent in Brogan Manor's previous configuration, Bowman said. These lights, along with the installation of security cameras, go a long way to provide a safer living environment for tenants, she added. "If I take a walk, I'll walk around this entire complex and it's still dark," Bowman said. "Then I come back over here (to the renovated apartments), and it's like a different area. "It's a blessing," she added about her living situation. Project completion is thus far slated for late 2015. The finished product will feature a playground as well as a community center with an on-site management office, a computer lab with wireless internet and a shared laundry room. Remodeling Brogan Manor's amenities called for AHA to transform the complex's business model. The $12 million project will be funded through a combination of state grants, allocated from the state Housing Trust Fund Corporation and Home and Community Renewal division, as well as the sale of low-income housing tax credits to private investors. To apply for the grant funding, Brogan Manor's regulations needed to be modified, said Stephanie Hutchinson, executive director. The remodeled Brogan Manor has shed its public housing designation, and applicable regulations, to be classified as nonprofit affordable housing. The main difference is the rent, which will become a set fee. No longer will rents be income-based — the change was not only required by the state, but was necessitated because an income-based rent system would not be enough by itself to sustain the improvements, she said. "There's no way to keep it public housing and do the renovations," Hutchinson said. "It would have been impossible." Whether or not rents will go up for tenants depends on an individual, case-by-case basis. Section 8 vouchers, for example, would keep rents the same since the voucher allows tenants to pay 30 percent of one's income as rent, Hutchinson said. The project has received support from the Auburn government. Local officials worked with AHA representatives to agree upon a 40-year payment in lieu of taxes agreement to keep rents affordable, Hutchinson said. The PILOT agreement was unanimously authorized by the Auburn City Council in September 2012. "They gave us a PILOT agreement that was extremely fair and I think that went a long way in indicating to the state that the city was supportive of the project," Hutchinson said. The Brogan Manor remodeling project is among a number of developments initiated by AHA in recent months. Last week, AHA officials applied for state grant funding to support a proposed $6 million housing complex on Merriman Street. In July, the AHA Board of Trustees banned indoor smoking at two other affordable housing complexes, Olympia Terrace and Melone Village. Consistent with this policy, remodeled units at Brogan Manor will also be smoke-free. "Brogan Manor is more than just a housing complex; it's an integral part of the neighborhood," Hutchinson said. "For that reason, we spent considerable effort to upgrade building exteriors and make the site more park-like to improve curb appeal."